It is so important, at an early age, to teach your children to love God and to understand the Bible. By doing so, you are setting them up to know there is someone that loves them unconditionally and will be there through out their lives. By sharing stories from the Bible, you show them that these were true and not make believe. Hotline to God has a new product out, Story Stix that will help you do just that. I had my friend Michelle and her daughter Joy review them for us. "I came home and Joy, my 5 year old, was playing with the Story Stix. She likes listening to the stories over and over and since she has 3 she asks me which ones come next, as in, the order of the bible. I, as the parent, enjoy the Stix since you can use them alone or while reading the bible story that matches. I think the voice is pleasant and easy to listen to. Joy also uses the phone. Sometimes calling it a radio. The volume does get pretty loud which is good when you don’t want to hold the receiver, but pretty painful if you are holding the receiver to your ear and THEN press the button, not knowing how high the volume is. I asked Joy about the voice that reads the verses and she says it kind of scares her and I have to agree. It’s not a pleasant sounding voice. Joy said she liked the phone because it tells her about Jesus and that it “calls people” (pretend play)." Story Stix is a unique hand-held, 6-button children’s Biblical educational toy featuring inspirational Bible scriptures. When a child presses the illustrated buttons, a prerecorded audio is heard. 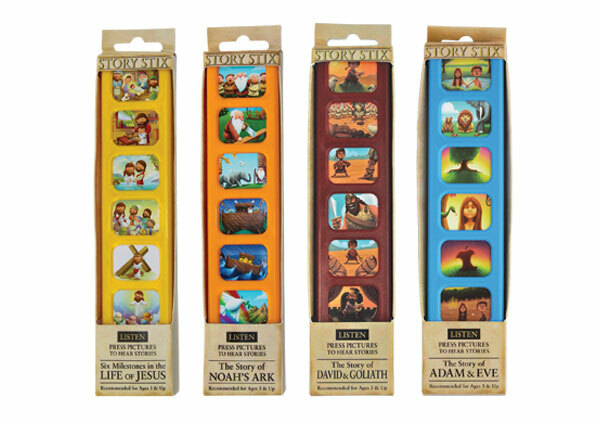 Story Stix brings to life the stories of Jesus, Noah’s Ark, David and Goliath, and Adam and Eve in rich, colorful detail that your child will enjoy and treasure for years to come. Children gravitate towards Story Stix because of their vibrant colors and child-friendly illustrations, and most importantly, their messages. Story Stix makes a wonderful gift for child’s birthday, first communion, Easter basket or Christmas stocking! Recommended for children ages 3 and older. Story Stix lets your child walk in Jesus’ footsteps through six milestone moments in His life. Follow Him from his birth in a Bethlehem manger to His youth honing His skills as a carpenter. Relive His baptism and feel His passion as He died on the cross in forgiveness of the sins of others. With Story Stix, your child can witness His glorious resurrection and ascension into Heaven. To learn more about this product, visit their website HERE. BuzzBloggers.com provided me with this product for free to review. All opinions are 100% Michelle's!